Yusuf Islam (born Steven Demetre Georgiou; 21 Julie 1948 in Lunnon, Ingland), oreeginally an commonly kent bi his umwhile stage name Cat Stevens, is a Breetish muisicker. He is a sangster-sangwriter, multi-instrumentalist, educator, philanthropist, an prominent convert tae Islam. His early 1970s record albums Tea for the Tillerman an Teaser and the Firecat wur baith certified as Triple Platinum bi the RIAA in the Unitit States; his 1972 album Catch Bull at Four sauld hauf a million copies in the first twa weeks o release alane an wis Billboard's nummer-ane LP for three consecutive weeks. He haes an aa earned twa ASCAP sangwritin awairds in consecutive years for "The First Cut Is the Deepest", which haes been a hit single for five different airtists. Stevens convertit tae Islam at the height o his fame, on 23 Dizember 1977, an adoptit his Muslim name, Yusuf Islam, the follaein year. In 1979, he auctioned aw his guitars away for charity an left his miusic career tae devote hissel tae educational an philanthropic causes in the Muslim commonty. He haes been gien several awairds for his work in promotin peace in the warld, includin 2003's Warld Award, the 2004 Man for Peace Award, an the 2007 Mediterranean Prize for Peace. In 2006, he returned tae pop muisic wi his first album o new pop sangs in 28 years, entitled An Other Cup. He nou goes profeesionally bi the single name Yusuf. His newest album, Roadsinger, wis released on 5 Mey 2009. ↑ 1.0 1.1 1.2 Ruhlmann, William (21 July 1948). "(Cat Stevens > Overview)". allmusic. Retrieved 30 June 2010. ↑ Phillips, Mark and Faber, Judy (12 August 2007). "Yusuf Islam Reflects On His Return: Artist Once Known As Cat Stevens Talks About New Album". CBS Sunday Morning. CBS News. Retrieved 11 February 2009. CS1 maint: Multiple names: authors leet (link) This story originally aired on 3 December 2006. ↑ Donahue, Ann (18 April 2009). "Yusuf Islam's past, present in harmony on new album". Reuters. Retrieved 27 April 2009. 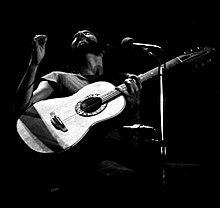 Wikimedia Commons haes media relatit tae Cat Stevens.